Today being the 100th anniversary of the sinking of the Titanic, I was reminded of the beautiful old hymn that famously played while the great ship went down. Namely, Nearer My God to Thee. I learned to play Nearer My God to Thee a few years ago for our annual funeral reenactment at the Merchant’s House Museum. It’s not actually a funereal hymn, but the one we’d been using, When Our Heads Are Bowed with Woe, was too obscure for the participants to follow on first hearing. A few months later, I recorded the hymn on the Museum’s 1850s harmonium so that it could be played at subsequent reenactments. There’s really nothing quite like 75 voices raised in a 150-year-old hymn, marching through the streets of the East Village. 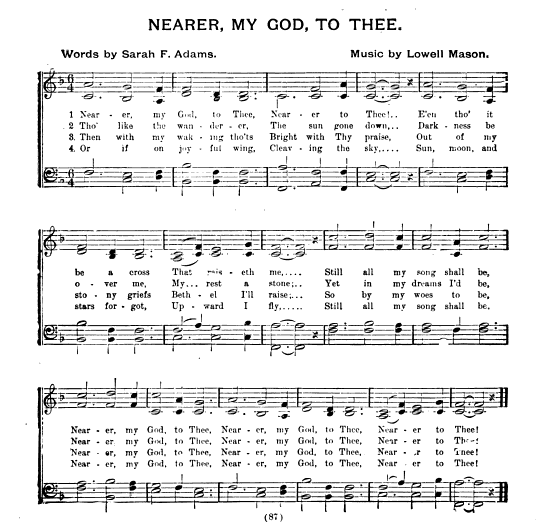 My dear friend over at Costume & Construction sent me a link to this early wax cylinder recording of Nearer My God to Thee. The life and story of the poetess who wrote the immortal words is summarized in Illustrated History of Hymns and their Authors, 1875. This language was the heart-utterance of Mrs. Sarah Flower Adams, daughter of Benjamin Flower, editor of The Cambridge Intelligencer, and wife of William B. Adams, an eminent engineer, and also a contributor to some of the principal newspapers and reviews. She was born February 22, 1805. 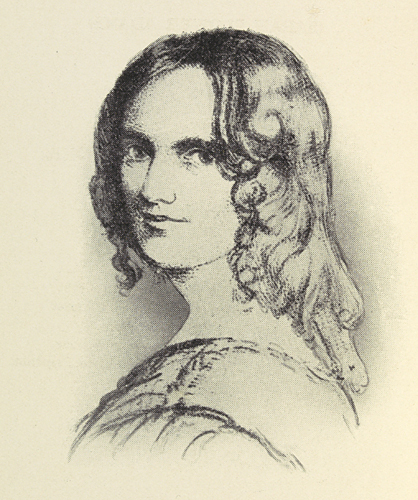 Her mother is described as a lady of talent, as was her elder sister Eliza, who was also an authoress. She died August 13, 1849, eight years after the issue of her popular hymn, and was buried in Essex, England. *Almost certainly consumption (tuberculosis), explaining Sarah’s subsequent decline after caring for her ailing sister. Very few people who died of tuberculosis during the 19th-century — and there were so many who did — were admitted to have perished from the disease, so great was the fear and prejudice associated with it.